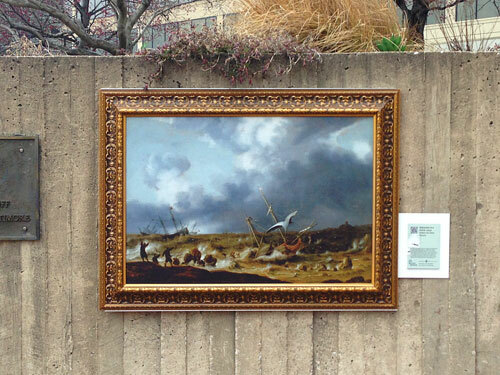 Off the Wall is a series of temporary installations in public spaces throughout Baltimore, initiated as an outreach effort by the Walters Art Museum. Reproductions of paintings from the museum’s permanent collection are on view through the end of 2013, including Shipwreck in a Storm by Willen van Diest at 200 East Pratt St.
It’s fun to encounter art in unexpected places, and I understand the idea behind this type of outreach effort, but does it actually bring new audiences into these art museums? What a fantastic idea! Too bad if we tried it here we’d just have more pictures of corn around town. We seriously do not need more of that. It’s an interesting outreach initiative, but I just wonder if it actually has the effect of getting new audiences into the art institution.